Bristol Street Motors Citroen in Leicester has won a regional award for excellent customer service as part of its work with the Motability Car Scheme. Baron Gilbert, motability specialist at the Raw Dykes Road dealership received the award, which is part of a programme launched by Motability Operations, as recognition for the outstanding customer service he and the rest of the team provides on behalf Bristol Street Motors Citroen Leicester. The award was judged on customer feedback and reviews of performance. The prestigious award ensures that all Motability customers receive exemplary customer service across the Motability Scheme's national dealer network. James Horne, dealer development manager for Motability Operations, said: "The focus of these awards is to thank our dealer partners for providing a consistently positive customer service experience. "It is important for us to recognise our dealer partners who go above and beyond when representing the Motability Scheme and highlight those who are setting a great example of how to do it well. "Many congratulations to Baron Gilbert, Alan Kershaw and the rest of the team at Bristol Street Motors Citroen Leicester on winning the award." Alan Kershaw, general manager at Bristol Street Motors Citroen Leicester, said: "It is a huge honour to receive this prestigious Motability Dealer Award. 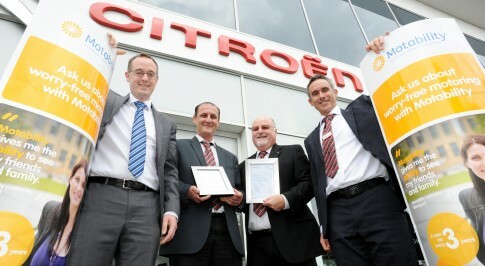 Customer Service is a top priority here at Citroen Leicester and we look forward to building on this success." The Motability scheme enables disabled people to exchange their Higher Rate Motability Component of Disability Living Allowance, their Enhanced Rate of the Mobility Component of Personal Independence Payment (PIP), their War Pensioners Mobility Supplement (WPMS) or their Armed Forces Independence Payment (AFIP) for a new car, scooter or powered wheelchair. Since it was set up in 1978, Motability has helped more than 3 million people get mobile with a brand new vehicle. Many of the vehicles in the Citroen range are available on Motability from Nil advance payment.